The Marshall Milton Keynes Athletic Club’s ladies opened their Division Two campaign with the journey south to Crawley. The home club were comfortable winners scoring 238pts. MMKAC had to settle for 6th place in a hard fought mid-table battle as only 13pts separated 4th place Glasgow(173) and MMKAC with 160. Joey Duck was the star of the day winning both sprints(100m/11.81) and 200m(24.12) and running a superb 54.9 leg for the 4 x 400m relay team. The field event athletes notched up good points – 19-year old Laeken Impey won the Hammer throwing the 4kg implement 45.33m with team mate, Emma Beardmore winning the “B” event(43.27m). Emma Beales placed second in the discus(40.35m) whilst Emma Beardmore again won the “B” throw(36.97m). The latter finished a busy afternoon placing 4th in the shot(10.11m) Rachel Gibbens won the high jump with a best of1m65m and Kewe King took 5th in the “B”(1.45m). MMKAC hosted the opening Eastern Veterans Track & Field league match at Stantonbury. On an evening spoilt by strong winds and heavy rain, their men won with 115 pts from Fairlands Valley(Stevenage) 101 and Bedford third(87). Positions were reversed in the women’s competition as the Stevenage club scored 119 and MMKAC 94. Luton took third place with 53. Perhaps the highlight of the evening was the performance of Jeremy Vick. 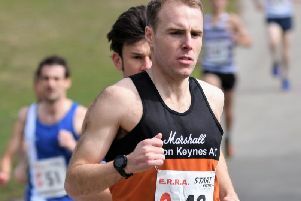 Having run the MK Marathon on Monday he came out on Wednesday evening to finish second in the 3000m and then running the anchor 800m leg in the medley relay he held off a strong challenge from Bedford’s final runner to hang on for a fine win. Meanwhile, the opening event in the East Midlands Grand prix series was the annual Silverstone 10km, two laps of the motor racing circuit and again with strong winds and rain making conditions quite tough for the runners around the very open countryside. This very popular race still attracted some 1100 competitors. The MMKAC men were led home by Mark Palser, 12th in 35.06 followed by Steve Green, 17th(35.550, Dan Webber 23rd(36.17) and Gary Blaber 24th(36.25). This quartet won the men’s team race. John Skelton, 83rd overall was first M60 in a time of 39.05 and Malcolm Down 8th M50(40.02). Tanya Taylor led the ladies, 8th female overall in 43.21. Next home was Debra Brent, 2nd F50 l(47.14) and then Leah Hartwell, 6th F35(48.03).